Pets are expensive. Not as expensive as children, but pricey nonetheless. You have to feed a cat, you have to clean a bird cage, you have to learn how to give a dog a haircut, or you have to pay someone to do all of those things for you. So whether you want to pay someone to do the hard tasks for you, or you want to save a little cash, cost is one thing to think about when it comes to buying a pet. Still really want that puppy? Then read on for how you can save yourself some money to spend on feeding your dog the best dog food available! This is the ultimate dog gift! Choose a beautiful basket and fill it with any or all of the above dog products. Wrap it with paper and tie with a pretty ribbon. For Christmas, fill a stocking with all of your dog's favorite things and hang it with your kids' stockings. The second step in giving your dog some at-home grooming is to gather your dog into your arms and make sure the dog is comfortable with you. Most dogs are not going to like getting a haircut, so this is something you need to be sure you are comfortable doing. Once you have your pup calmed and relaxed, sit your dog in the area that is easy to clean up or vaccuum. The third step to give your pup a haircut, is to hold the dog still and begin trimming away. Hold your dog on the blanket or towel so that there is something soft beneath the dog's paws. To make this easier, it is wise to have your friend holding the back end of your dog while you hold the dog's face and shoulders still. Your dog will be sure to wriggle and try to get away, especially if the noise of the electric razor makes the dog uncomfortable. Therefore, make sure that you and your friend have a firm hold on the dog. You cannot hurt your dog by holding him tightly, but you can hold your dog with a razor! So holding the pup still is a far better plan than accidentally nicking your dog! 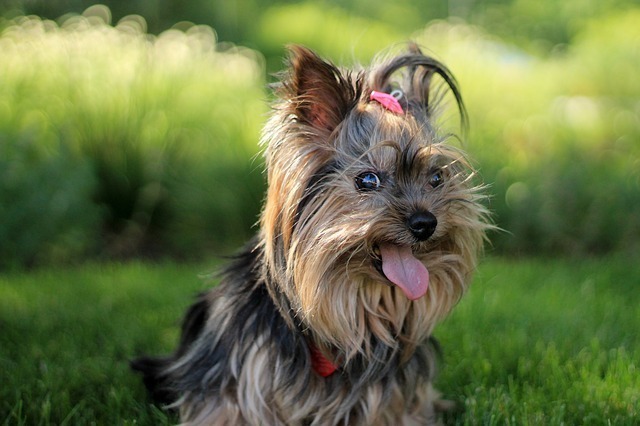 ​Begin at the scruff (or neck) of the puppy, shaving on a low setting towards the tail of your dog. Keeping the sound moving backwards from the dog's ears can help in keeping your puppy calm. Make sure that you move in a clockwise fashion, shaving your dog's fur around the circle of the dog's body. Keep the electric razor on the low setting so that the fur remains the same length! Once the body of the dog is shortened, it is time to focus on the legs of your dog. Please note that this may be easier to complete with hand-held scissors rather than the electric razor. Snipping at the fur along the paws and leg of the dog should take place one leg at a time, and this same technique should be used on the tail and on the face of the dog. Finishing your dog's haircut is much easier than the cutting process. Once your dog is free of your tight grip, he will scamper away and get used to the freedom of no longer having so much fur! You will then be stuck cleaning up the hair. With your broom or your best handheld vacuum for pet hair, clean up the pet fur, give the towel a good wash, and consider all the ways you can spend the grooming money you saved!